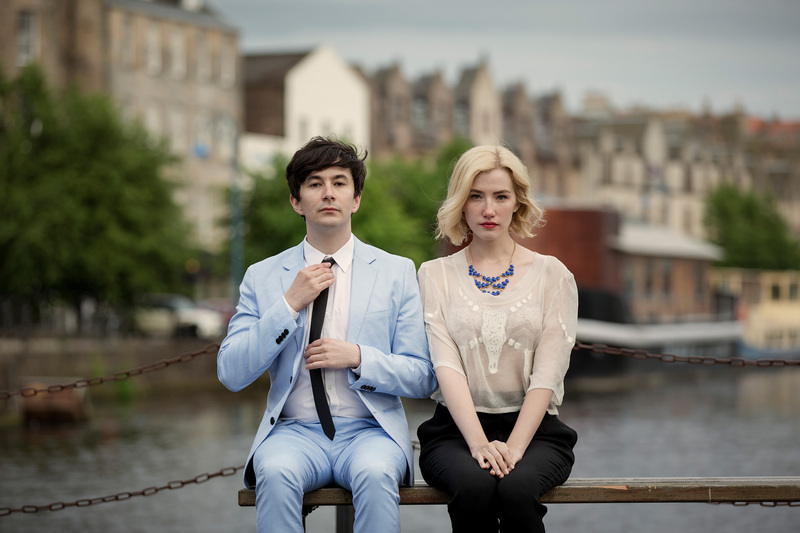 I love this couple’s shoot in Edinburgh with Jenni & Stuart more every time I look at it. It’s the day before their wedding at Prestonfield and we’ve visited Edinburgh’s new town, old town, and the Shore in Leith to capture a mix of Roman Holiday inspired candid photos, and Wes Anderson looking portraits. Turns out we were all huge fans of Wes’ self aware style and they’ve worked it beautifully. Take a look at Jenni’s The Blushing Bird store for more of her wedding style. She’s got great taste, so her Instagram account is well worth following too. You can also check out one of Stuart’s latest magical tricks from The Next Great Magician here. In this couple’s shoot, my favourite photographs are sitting outside The Ship On The Shore in Leith where we were so convincing with our paparazzi approach to the candid lovers, we eventually gathered a small crowd of tourists keen to see who the celebrities were. The Industrial look of the docks was a great contrast to the west end of Edinburgh with it’s regulated Edwardian houses and grand pillars. But Edinburgh has many photogenic options so a finale on The Royal Mile in the old town gave us yet another romantic and stylish setting. Take a look at the wedding photographs from the next day here, and you’ll see I loved working with this couple so much. You can’t beat a bit of Scotland’s capital for your photography. “Slange var” Edinburgh!